Here's a pic of the six different styles I ended up with. 40 of these cards are going to a local hospice provider who is going to deliver cards to all the veterans that they provide services for. The rest of the cards are going to be used at my office. We are having an Anyhero card signing event for Operation Write Home. Between Armed Services Day and Memorial Day we are going to place boxes in our three lounges with instructions on how to write an Anyhero message. We will have a place for them to leave their completed card and then I will send them all off to OWH in June. We've never done anything like this before but hopefully my building full of 300 employees can manage writing 80 cards. Hopefully I will be pleasantly surprised and we run out of cards during the first week of our event! 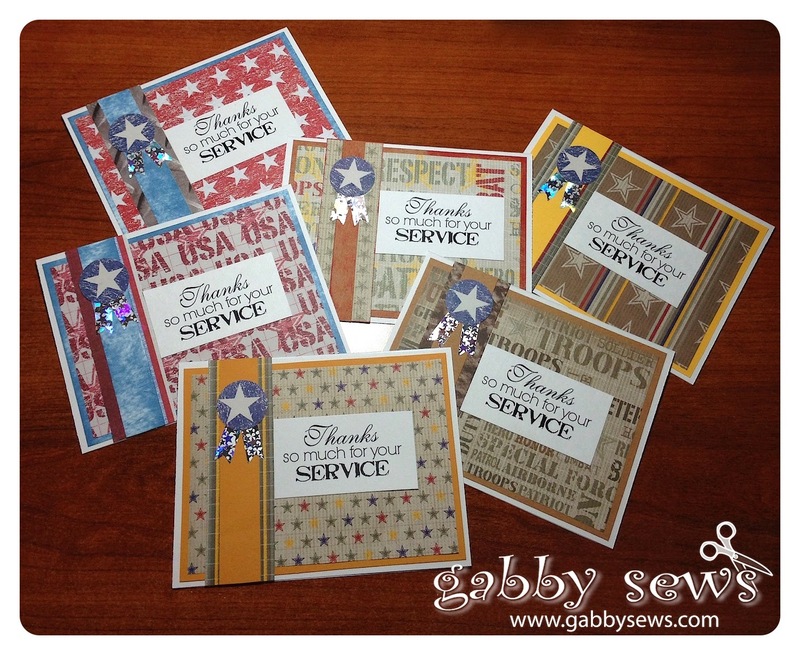 The patterned paper all came from the Proud to Serve paper stack from The Paper Studio. The solid card stock is all from Core'dinations and the card bases are Georgia Pacific standard card stock from Sam's. The holographic paper I used for the ribbon tails was purchased at Hobby Lobby in their by the sheet section and I used my Cricut Close To My Heart Art Philosophy cartridge to cut them all out (Banner2 on page 29). It was actually quite funny once I got them all cut out and then put the Cricut mat on my desk to remove them. First thing I noticed was that I had to turn off my desk lamp because I was blinding myself (not to self - do NOT hit holographic paper with a high powered Ott Lamp!) and then I realized the holographic paper was actually sticker paper! It was a little bit more challenging to get those little buggers off the mat but it sure made it easier when it was time to adhere them! The sentiment is from Doodle Pantry and I punched the stars out from a piece of pattern paper in the stack I used. It was so awesome that my smallest punch fit the stars exactly. I'm thinking everything about these cards was really meant to be because I had just enough paper in the stack to punch out all the stars I needed with only a couple extras! I used a consultant sketch from Close To My Heart and tweaked it just a bit to fit the paper supplies I had available. I'm still trying to use up all my stash of non CTMH papers. I must admit though that it's been hard to go back to using those others papers after I've used CTMH paper. Their paper is a joy to work with and now that I've used some higher quality paper I think I might be spoiled. One special thing I did have to do was create my own solid card stock for the cards with the blue background and strip. I didn't have any blue in my stash that seemed to work so I took some of the GP white card stock and rubbed a Tim Holtz Distress Ink in Faded Jeans all over it. I liked the effect so much that I did the same thing to some Kraft card stock using Barn Door and used that paper on the card that in the middle of the above picture. It really gave it such a great dimension! Ribbon Tails - 1 x .5 - they are really tiny and you need to use some tweezers when you are working with them!